If you're the the sort of visual artist who digs LOTS of fine detail, but you'd still like the freedom of creating fat ink lines at will, the inexpensive croquill pen ( very easy to find in any art store) is for you. About the only thing that is a bit bothersome is having to dip the pen nib constantly to maintain ink flow. Primarily, I enjoy the flexiblity of the nib which allows for a huge varity of line widths. With a little patience and practice, you'll find how enjoyable it can be to just to cut loose in your sketch pad, playing with shading effects and line weight. Well then I'll get one to draw my stick figures with. As I've said before, I'm horribly left brained. One sided - no art skills at all. I can do some music, but that's actually mathematical. I love your drawings. Fills in my blanks. Last time I tried to draw something, the 3 yr old grandson couldn't stop laughing for 2 days. Well, there ya go. You've found your audience! (1) Is "croquill" synonymous for "crow quill"? (2) I take it this is a cartridge pen? (3) Do you have to dip the nib in ink, water, or something else? (4a) Is there more than one size croquill nib? (4b) If so, do you recommend one nib in particular or a set? (5) Any tips for a REALLY heavy-hand? I bear down so hard--even when I write--everything I do practically ends up being embossed. I have oily skin, & if I hold a pen lightly, it slips out of my hand. As I tighten my grip, for some reason I bear down harder (I found a partial solution by gripping with an extra finger--a college friend told me I hold a pen like a Japanese calligrapher holds a brush). I've found that fountain pens do curb that tendency, but it's a constant problem. I used Sakura or Staedtler pens for a while, but the stores around here quit selling them 10 years ago, so I basically quit drawing out of frustration (although "the bug" bites me occasionally). Hey John-These are looking good-I haven't thought of a croquill pen in about 20 years. You should try one of those pens with the giant feather next. 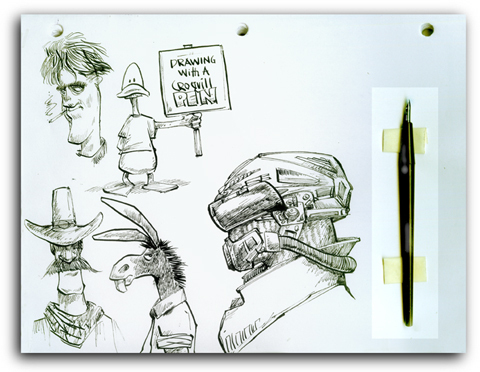 I still occasionally do drafting by hand, and I have a couple of these in my pen box for lettering dimensions. I had an art teacher that used to imitate etching style with ink on paper with one of these. That's a very realistic trompe d'oeil pen on that sheet. I've been able able to find out there are several "croquill" nib sizes, but not much else. There aren't any carried in the 2 "craft" stores there are here. Hey just wanted to say i love your blog. It is definatley one i will be checking regularly. Must say that on this subject matter I really do have to take sides with your point of view. What would all of us do without the amazing tips you talk about on this blog? Who comes with the endurance to deal with important topics for the sake of common visitors like me? I actually and my buddies are very blessed to have your website among the ones we frequently visit. We hope you know how a great deal we enjoy your working hard! Best wishes from us all. I kinda like this blog. For some time, I've been making an attempt to create one one thing like this as properly, nonetheless I am not laptop gifted on methods to do it.I kinda like this blog. For some time, I have been trying to create one one thing like this as properly, nonetheless I am not pc gifted on the best way to do it. Thank you for due to this spectacular post. i am invariably near to the present up out for content material material and was lucky to uncover you on yahoo i am going to completely be back nonetheless again againg to ascertain what different spectacular content materials you post. You can choose a wholesale supplier you trust can do something. But with the help of online directories that you do not worry too much. to help online directories like Salehoo to find wholesale suppliers of their choice. Sweet website , super design and style , real clean and utilise genial . I won't argue with your choices simply because I think you're precise on the money! You've come a reasonable situation for your views and now I understand much more about this distinctive topic. Many thanks this awesome publish and that i also will come back for additional. Thanks for putting up this article. I'm unquestionably frustrated with struggling to search out germane and rational comment on this subject. Everybody nowadays goes to the very far extremes to either drive home their viewpoint that either: everyone else in the planet is wrong, or two that everyone but them does not really understand the situation. Many thanks for your concise, applicable insight. You ought to really think about working on growing this blog into a dominant voice in this field. You clearly have a grasp grasp of the areas everyone is searching for on this blog anyways and you could maybe even make a buck or two off of some offers. I would look into following recent topics and raising the volume of posts you put up and I guarantee you'd begin receiving some awesome traffic soon. Just a brainstorm, good luck in whatever you do! This web site is mostly a walk-by for all the information you wished about this and didn’t know who to ask. Glimpse right here, and also you’ll undoubtedly uncover it. Heya i am for the first time here. I came across this board and I to find It truly useful & it helped me out a lot. I hope to offer something back and help others like you aided me. I really happy to find this internet site on bing, just what I was looking for : D too saved to my bookmarks . Thanks for the recommendations on credit repair on all of this site. The thing I would advice people is usually to give up this mentality they will buy now and pay back later. Like a society all of us tend to make this happen for many issues. This includes getaways, furniture, plus items we really want to have. However, you have to separate your current wants from the needs. As long as you're working to raise your credit score you really have to make some trade-offs. For example you can shop online to save money or you can click on second hand suppliers instead of highly-priced department stores pertaining to clothing. require to know by now, your writing goes to the nitty-gritty of the topic. Your lucidity leaves me wanting to know much more. Just so you realize, i will immediately grab your feed to keep up currently together with your weblog. Saying thank you is simply my little way of saying what a masterpiece for any grand resource. Let In my nicest wishes for your incoming post. I'm having a hard time subscribing to your feed. Would you mind emailing me so we can figure it out? play online casinos games at the all new the casino. Definitely, what a splendid website and revealing posts, I will bookmark your site.All the Best! This page contains a single entry from the blog posted on October 10, 2009 12:22 AM. The previous post in this blog was Congressional Picnic.